Virtual reality isn’t all about gaming, education, training, and health. We all have data, lots of data. Just by watching the video, we know how big data in virtual reality can provide an ability to understand huge amounts of data in shorter time. Moreover, it helps us find properties that were not anticipated and understand how data was collected. Read more: Big data in virtual reality by Virtualitics. VR Creative Use #2: Behind the scenes of a brand. In partnership with Visual Experience, Lomar, a clothing brand based in Saudi Arabia, brings fashion fans closer than ever to Behind the Scenes of Lomar. So, for the first time ever in fashion history, customers can tag along with Lomar at the factory, watching each step of the production in a 360-degree environment, as if they were there. Thus, the customers can see every single detail of the proccess, knowing that each product of Lomar is crafted carefully with love, enhancing people’s trust and loyalty towards Lomar’s brand. Behind the Scenes of Lomar was made by BeThere, the most artful VR/360 viewer in the market. The first edition of BeThere. Contact BeThere to get your personalized artful VR viewer. It’s nothing like you’ve seen before. Nasdaq, an American stock exchanged, released a Nasdaq Index Rollercoaster. This shows how virtual reality could transform your data in a much, much better way. In line with Saudi Vision 2030 to build up the sector of renewable energy, Mishkat, the Interactive Center for Atomic and Renewable Energy, launched a BeThere: Renewable Energy, in partnership with Visual Experience. BeThere: Renewable Energy is a virtual reality merchandise. It includes the most artful 360/VR viewer and a VR application to learn about renewable energy in a form of game, mainly for students and kids. Contact BeThere to get your personalized artful VR viewer. Aqua — an immersive experience focused on relaxation in an undersea environment. AMO —an immersive experience focused on easing pain and anxiety based on clinical hypnosis techniques. KIMO — an immersive experience focused on providing basic education to pediatric patients on how chemotherapy works. Spacio — an immersive experience for pediatric patients aimed at inducing relaxation before having an MRI or a radiotherapy session. Stella — an immersive experience aimed at inducing positive distraction during short pediatric procedures. Today’s marketing has used virtual reality for its marketing campaign. Some are in a form of virtual reality merchandise. For example, Volvo launched a new marketing campaign with the release of Volvo Reality. It is a Volvo’s branded virtual reality merchandise a.k.a viewer. With this merchandise, customers can do a test drive of the new Volvo series. 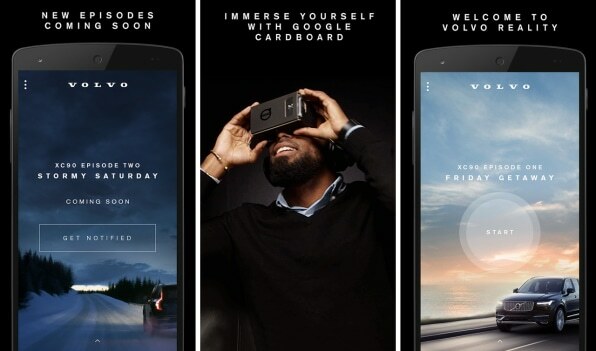 Most importantly, this virtual reality marketing campaign has helped Volvo to sold out the new Volvo series just in two days since the day it was released. There have been more unusual yet creative uses of virtual reality, what do you know? Share with us!